"First, I love to travel. 2nd, a great evangelist once had a vision, in which he was on board a ship in a vast sea. In that dark ocean of water surrounding him was a multitude of souls, drowning. One by one he pulled them into the ship, but alas, he was only one, and for every one he saved, thousands drowned. The ship was large, but his arms were weak. Jesus is the ship to heaven. We are the evangelists. We must save as many as possible, lest they go to Hell. Here at BLC, we are bringing you into the ship of God's grace by sharing with as many as possible about salvation through Jesus' death on the cross. Come, enter the Gospel Ship!" "WHY YOU MUST BE BORN AGAIN"
It was that "waiting time" between the picnic meal and the beach baptismal service. We were waiting for the chicken, noodles and rice to digest. With a pile of gospel tracts in my hand, I slipped off and went to work. "Why You Must be Born Again" read a drunkard, as he shuffled his cards with one hand and set down his cigarette to take my tract with the other. "Hallelujah, Jesus Saves!" chided an old lady with a wrinkled face, wrapped in a towel, and grabbed a tract from me with her shaky hand. "What's this?" asked a teenage boy in a basketball jersey. "Don't worry, it is free." I assured him. Once they heard the word "free", all his buddies came over to get one. Concerned that my Philippine visa had expired, we traveled as a family to Hong Kong, so that when we'd re-enter the Philippines, my forfeited visa would be cleared. A week after we returned to Davao, I visited the immigration department, only to find out that, since I traveled with my wife who is a Filipina, I am considered "balik-bayan" (returning national), and do not have to renew again for another year! Praise God! 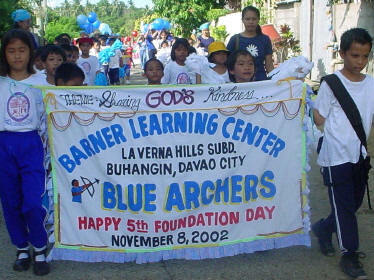 BLC's 153 pupils march is a musical parade to begin 5th Foundation Day festivities. While in Hong Kong for two weeks, Elvie and I spoke in 2 churches, a hour apart from each other, both in the same afternoon. They were Filipino congregations of "OFW's". OFW's are Overseas Foreign Workers. Every year, since the Philippines is such a poor country, over a hundred thousand Filipinos will go to other countries to earn a living as maids, nurses, doctors, mariners, and nannies. 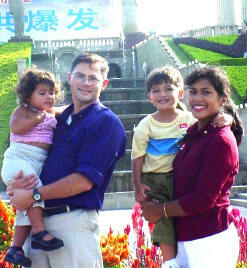 They miss their families immensely, yet help in lifting their families back home up out of poverty. It was to these homesick OFW's that we came and challenged them that THEY are missionaries, just by being Christians in a foreign country. As they are faithful to God, then their destiny, God's calling on their lives, will be clear. They cannot forget to be faithful in sharing the gospel, studying their Bibles, praying and worshipping at church. Some Hong Kong churches have now promised some support for our Davao work, giving in advance 1100 HK ($170 US) to help get plywood for our new fourth grade classroom to be built in December. We'll visit HK again in February.